Have you been looking for the appropriate miter saw for your DIY projects? I have spent hours researching the top 5 models that could be a great addition to your collection. If you find it helpful please share it with others. Remember this: everyone has different budgets but if you plan to become a professional then you should consider spending a bit more. 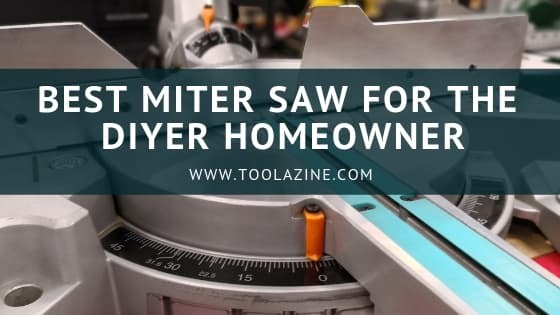 If you’re a professional then I suggest you check out The Best Miter Saws Review for more advanced models. Have a close look at the full description of each model so you don’t miss anything out! Related: Band saw vs miter saw: what are the differences? There are a few things that I want to go over before starting out with the descriptions. My guess is that there are new workers looking for a miter saw to start out. If you already own a miter saw then let me refresh your mind before picking a model. You should look at the amperage of the motor. If the amperage is higher then there’s more cutting power. This depends on your type of projects so if work with tougher woods then you should look for a model with higher amperage. This is pretty important too. Again, it completely depends on what you’re going to be working with but you should know that a larger blade diameter can make longer cuts. Positive stops allow you to make accurate cuts on a specific angle, some models have a few more positive stops than others. This helps when working with detailed projects. It’s better to look for a model with more positive stops because it saves time when setting up a cut. This allows you to adjust the height of the blade. This is pretty convenient because you are able to control how deeply the blade cuts into the piece. This is very personal and you should think about the projects you have in mind, the type of wood you’re going to be using and the size of the workpiece. There are definitely some advanced models that are a bit expensive but if you plan to develop your skills then it’s worth spending more. If you’re a beginner then look for an affordable and simpler model that can help you start out. The Homecraft H26-260L is manufactured by Delta. The model runs on a 14 amp motor. This saw can reach 5500 RPM, which is the fastest from the review. This is convenient for DIYers that work with tougher woods because the blade spins a lot faster which makes the cuts easier. It comes with a 10 inch blade diameter which is appropriate for most projects. The model weighs 31 pounds which makes it easy to carry from one place to another. If you work on both inside and outside environments, it’s important that your saw is lightweight. Another feature I like is the built-in laser, this is a great guide for workers that don’t have much experience. I give this model 4 stars. It has good features and an affordable price. Go check out the latest price of the Delta Homecraft H26-260L here on Amazon. The Black & Decker M1850BD works with a 9 amp motor. This saw has a blade diameter of 7- ¼ inches. It’s the smallest from the review. This model would make a great pick for beginners. It’s not as powerful as other models but it’s a great option for small DIY projects. Another advantage is the price, if you’re looking for a saw to start developing your skills but don’t want to spend too much then this is the best choice. It’s also a lightweight model which makes it easy to move around. It has a carrying handle which makes transportation comfortable. It comes with 9 positive stops which is a good amount of options for new workers. Overall, I give this model 4 stars. The brand is very reliable and it has great features. Take a look at the latest price of the Black+Decker M1850BD here on Amazon. The Hitachi C10FCE2 has a 15 amp motor that can reach 5000 RPM. This is by far the most powerful model, which makes it a great pick for workers that use harder types of woods. The model has a blade diameter of 10 inches. It has a 0° – 52° miter angle range which is important to achieve greater versability. This model is a good option for users that work with bigger pieces. It comes with a large extended flip fence which allows bigger pieces to have support. One more thing, it comes with thumb activated positive stops which makes these adjustments a lot quicker. I give this saw 4.5 stars. This model has advanced features that require a bit of experience. Check out the current price and the latest customer reviews of the Hitachi C10FCE2 here on Amazon. The DEWALT DW715 runs on a 15 amp motor. This saw can reach 4000 RPM. This model is a bit more expensive than the previous products. I recommend this option for advanced DIYers that require a heavy-duty model. It has a blade diameter of 12 inches which is the largest from the review. It comes with 11 positive stops and 3 hardened steel bevel stops which allows the user to have greater productivity. It has fence support for bigger workpieces. One more thing, it comes with a carrying handle which can be helpful when moving the model. The previous feature is very important when working with larger pieces because you’re probably going to need to work outside. I rate this model with 5 stars. It has outstanding features and it has great reviews. Have a look at the current price of the DEWALT DW715 here on Amazon for more details. The Makita LS1040 has a 15 amp motor that can reach 4600 RPM. This model has a 10 inch blade diameter. It comes with 9 positive stops. It has a precision machined aluminum base which ensures accurate cuts. Like the previous model, this one too is a bit expensive. If you have a bigger budget and are looking for a high-quality miter saw then this is a good option. It comes with a shaft lock which makes blade changes easy and quick. In comparison to the Dewalt model, this saw only comes with a year of warranty which isn’t much. I rate this model 4 stars. Check out the latest price of the Makita LS1040 here on Amazon for more information. I hope I helped you pick a model. Remember to go over the specifications carefully so you know exactly what you’re getting.